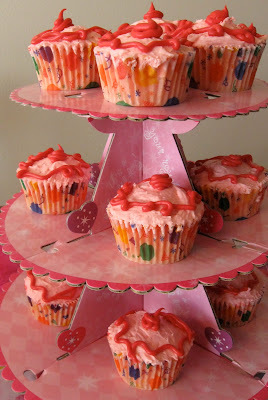 Yesterday, Saturday, Feb. 12, 2011, husband Walter and I traveled to Louisiana for a Pinkalicious party. 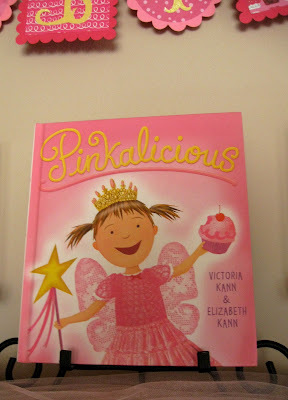 Little girls of a certain age seem to be enthralled with the Pinkalicious series of children’s books. 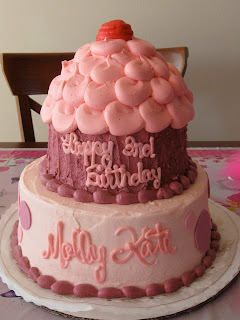 Granddaughter Molly Kate had the first in the series, titled what else but “Pinkalicious,” and celebrated her birthday #3 with a party centered around the book’s title character. 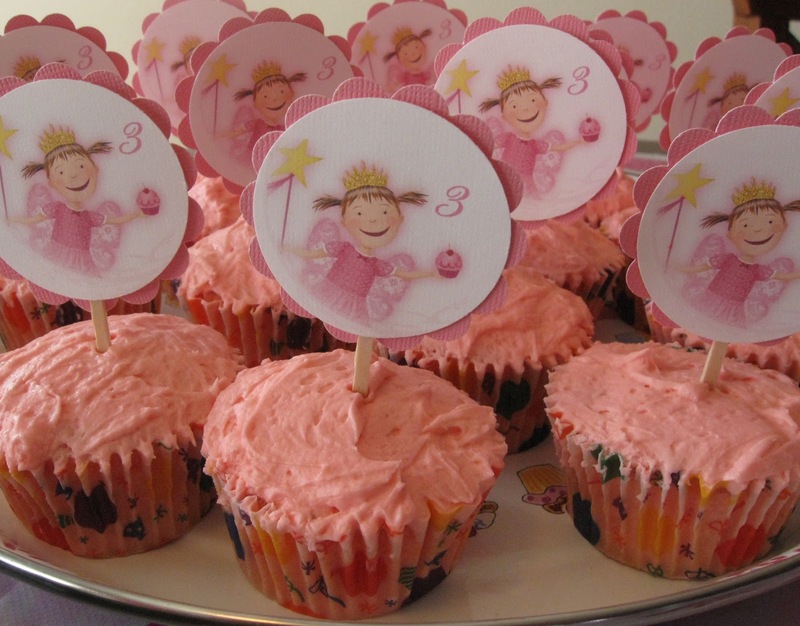 Pinkalicious book takes place of honor among party decorations. Pinkalicious is a little girl who loves all things pink, pink, pink and experienced some remarkable side effects from her overindulgence in pink cupcakes. True to the popular narrative, guests were treated to pink cupcakes. Molly Kate was a little overwhelmed as her dozens of guests, adult and kid-sized, arrived. Initially she took a low-key approach to the festivities. By the time everyone finished lunch and gathered for the singing, candles and birthday cake, the birthday girl was ready to party. 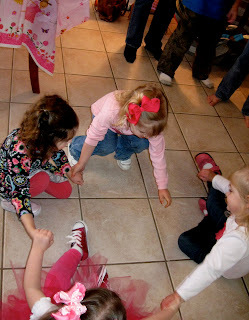 Wearing her pink tutu and pink bows that her Aunt Blair had made her, she was busy gathering her little friends and a cousin to play Ring Around the Rosie. 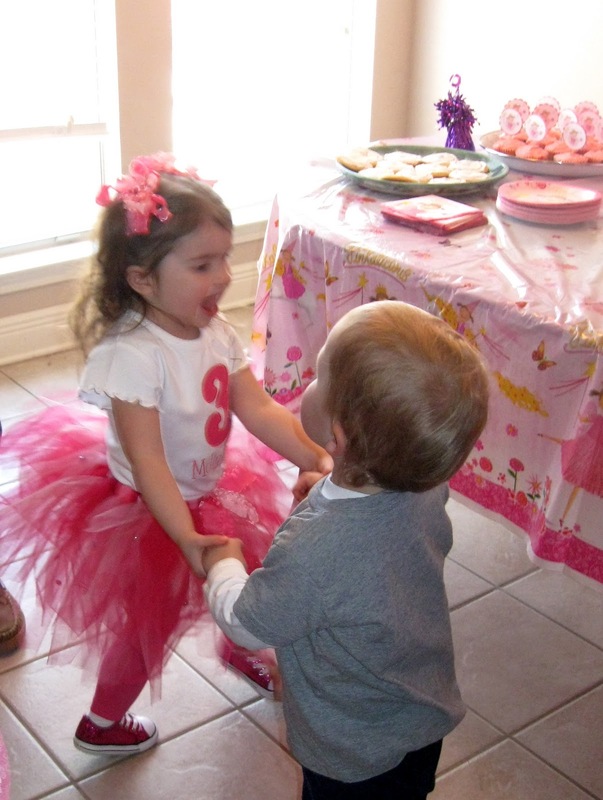 MK executes an enthusiastic ring around the rosie with a somewhat bemused buddy Noah. By the way, I googled the Ring Around the Rosie nursery rhyme, just to check spelling and see if I could find out why I grew up with “upstairs, downstairs, all fall down” instead of today’s “ashes.” The Snopes site debunked some information I had read years ago about the meaning of the rhyme. If you click here, be sure to go to the end for John Lennon’s comment on the meaning of lyrics. Little brother Walker, celebrating his 9-month mark, entered the gift-opening excitement. 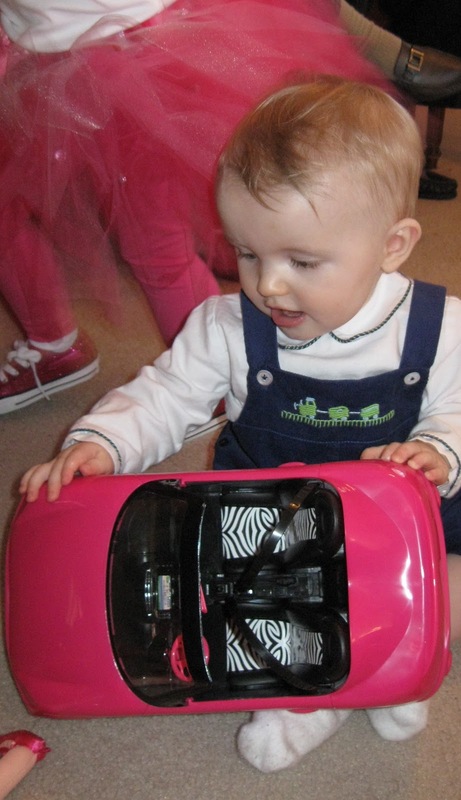 Once he exhausted the pleasure of playing with wrapping paper, he headed for the least girly of his sister’s new possessions, Barbie’s convertible. Walker gets ready to take a spin. In the quiet aftermath of the pinkalicious party, a thrilled Molly Kate worked through her gifts, systematically trying them out, one by one. Below, she has just finished examining the little doll that came with a pediatrician’s tools of the trade. 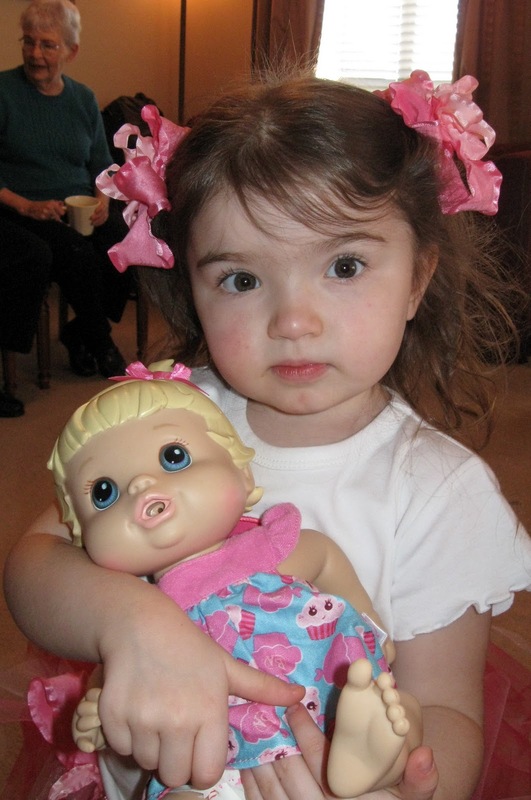 Fledgling pediatrician Molly Kate proudly pronounces her new doll healthy. Happy pink birthday, Molly Kate! This is so sweet. I guess I'm past the little girl stages and didn't know about Pinkalicious. Very cute theme and your little Honey is darling. Happy Birthday to her. Oh yes! 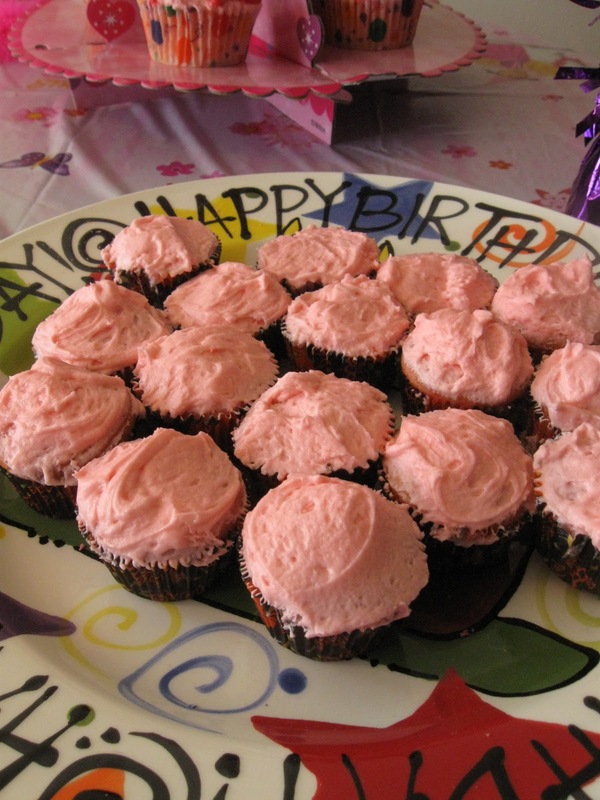 We know all about Pinkalicious around here, thanks to Madison! What a neat theme for a birthday party! 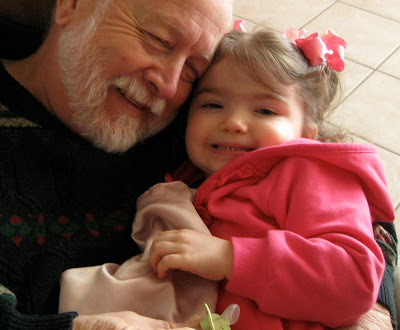 Great photograph of your hubby and Molly Kate,on her birthday. I love little Walker taking off with Barbie's car. LOL He's growing up so fast!